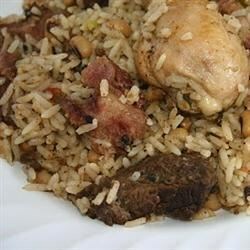 "This is a Caribbean One Pot Dish, which includes chicken, fish, rice and vegetables. Serve hot!" Rinse chicken, pat dry and season to taste. Heat oil in a large skillet over medium high heat. Add the chicken and brown, then add the onion, celery, and gravy browning and saute until onion and celery are soft. Next, add the water, rice, peas, fish, tomatoes, carrots and salt and stir all together. Cover skillet, reduce heat to medium low and simmer for 25 to 35 minutes or until the rice and peas are soft but grainy. This was incredibly bland as listed. Definitely needs tweaking, but has potential. I lived on St. Lucia for 3 1/2 years and this is SO Caribbean!!! If we were there we wouldn't buy "browning" we would make it by crystalizing raw sugar... Recipe is very native to the Islands. We use coconut milk in Guyana and more pepper. Otherwise it's delicious.